Every organisation will tell you they have a strategy, but only 10% of those organisations are successful in implementing their strategy. What’s more, only 5% of employees really understand how they specifically contribute towards strategic achievement. So, having a strategy is one thing, but implementing it successfully and communicating it across the organisation is quite another. Our consultancy services help organisations to become part of that 10% and 5% respectively. 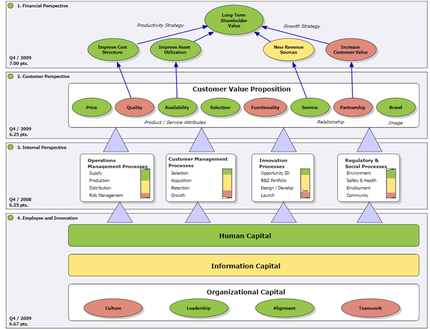 Strategy maps are a key component in the process of communicating an organisation’s strategic direction. Simply put, they are a pictorial representation of the organisation’s strategy shown across a number of perspectives in order to identify the strategic initiatives which are paramount to the organisation’s success. As part of an integrated performance management system, they offer a real opportunity for an organisation to improve strategic performance. We provide consultancy services to deliver strategy mapping programmes, enabling organisations to reassess; where they are, where they want to be and how they want get there. Through a series of executive interviews and / or workshops, working together with the client, we map out the organisation’s strategy. Once we have the 'corporate' strategy map in place and agreed, it can be used as the foundation and blueprint to create strategically aligned departmental / business unit strategy maps. The strategy map(s) is then transposed into a tightly focused performance management / balanced scorecard framework. Our consultants have a wealth of knowledge and experience accumulated over many years, through projects delivered both in the UK and internationally. Our aim is to build long term, mutually beneficial relationships lasting way beyond the initial engagement and to be seen by each and every client as on-going trusted advisors, offering invaluable strategic support.